Happy New Year from the team at SPDT 4 LIFE at Golden Sand Bay Hospital. We hope you all had a safe, happy and healthy holiday season. We are very excited about all the amazing improvements we have planned for 2017 that will make SPDT 4 LIFE the worlds leading holistic cancer treatment centre. Now that the holidays are over, we are working in earnest with our partners and team of experts to bring to you the most unique, effective and diverse, evidenced- based holistic cancer treatment program available anywhere in the world. Our aim is to help as many patients as we possibly can – particularly those who have been given no hope elsewhere. In the meantime, our highly experienced team of doctors and nurses will continue to provide the highest level of care that we are famous for and in our hotel like environment – with large rooms with ensuites, queens size beds, flat screen TVs and many of the other cherished comforts of home. The improvements we are making will only compliment the already extensive range of traditional and new best practice methods we offer our patients – such as SPDT. Dr. Wang and his team at Golden Sand Bay Hospital are the world’s leading authorities on SPDT and have the best equipment available anywhere, including the purpose built ultra-sound baths used in this highly effective non-toxic treatment. We look forward to bringing your more information, as we get closer to introducing our new programs to SPDT 4 LIFE – stay tuned for the exciting updates. 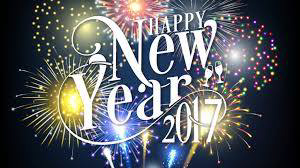 All the best for a safe, happy and healthy 2017. The SPDT 4 LIFE Team. This month we are happy to bring you an update on one of our cherished patients – Toni. Toni is a 73 year old mother of three adored children, from Lake Macquarie, NSW. She is a chiropractor with a keen interest in health and wellbeing. Her understanding of the body and how it works has certainly helped her in her recovery from multiple cancer diagnosis. Toni originally came to our team for treatment in December of 2015 when we were located at Renkang Hospital. She had previously been diagnosed with breast cancer and had a lumpectomy in 2014. Then in 2015, she was diagnosed with bowel cancer – another primary cancer. Her doctors in Australia performed a mastectomy, removed part of her bowel and put her on a 6-month course of oral chemotherapy. Unfortunately this was not effective and Toni’s cancer spread to 6 bones and both lungs. At this point Toni’s oncologist told her that her cancer was terminal and there was nothing more that could be done for her. sadly passed away in September 2014. On receiving this terrible news from her doctor, Toni chose to fight for her life and look for a solution elsewhere. She had read about a man form Melbourne who had been diagnosed with terminal cancer and given no hope for survival by his Australian doctors, who then travelled to Renkang Hospital in China for treatment. His treatment had been successful and he returned home much improved. Toni decided she would call Lucy Li the director of the cancer treatment centre at Renkang, to discuss the possibility of her receiving treatment there. That was in November 2015 and 3 weeks later Toni was in Renkang receiving treatment. Once at Renkang, Toni was greeted by the very friendly team of interpreters, doctors and nurses. She was made comfortable in her room and then met with her doctors to discuss plans for her treatment. Once settled in at Renkang/SPDT 4 LIFE, all patients undergo an extensive range of tests to establish their exact state of health. From this the doctors are then able to tailor a specific treatment protocol for each patient. One of the most important tests done for all SPDT 4 LIFE patients is the RGCC test, to establish what the individuals specific cancer is most sensitive to. Toni underwent these tests and based on the results, her doctors prescribed a protocol that included 4 cycles of SPDT, combined with low-dose chemotherapy and a range of IV medications that would protect and support her organs from the ravages of chemotherapy. Toni responded remarkably well to her treatment and was feeling well enough during her 3 month stay that she was walking a kilometer a day by the end of her treatment. The doctors monitoring her progress found that via blood tests her tumour markers had dropped significantly after the first cycle and continued to go down over the course of her treatment. 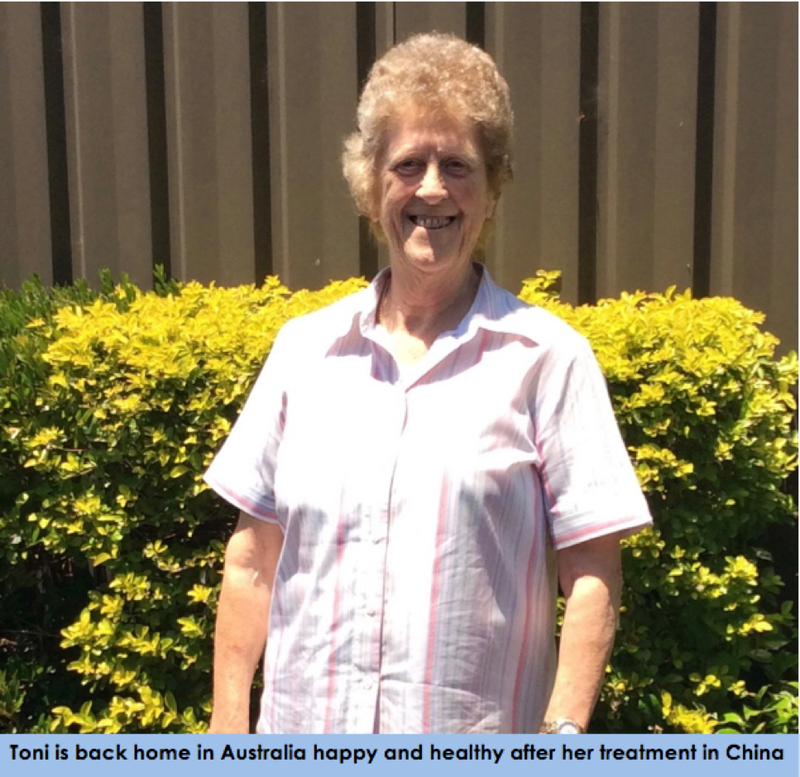 Toni’s was a steady and consistent response, that was confirmed in the scan she had 3 days before she left China. The tumours in her lungs had completely gone and most of the bone metastasis had reduced significantly – they were close to gone – except for one residual tumour on her T11 vertebrae. This was an outstanding response and needless to say Toni and her doctors were all very pleased with the outcome. Toni left China in a much-improved state of health and committed to maintaining a healthy lifestyle and following a program that would help her body fight the remaining cancer. Since returning home in early 2016 she has been a model patient and has been following the recommended health plan that the team at SPDT 4 LIFE are committed to. Toni eats a diet of organic food that is free of the inflammatory ingredients that have been linked to cancer. She exercises regularly which includes swimming and she has done Tai Chi for 20 years. She also takes the recommended supplements and medications prescribed by her doctors – and avoids toxins and known carcinogens. With research proving that approximately 90% of all cancer is now caused and exacerbated by poor diet, lack of exercise, stress, smoking, drinking and exposure to harmful chemicals and environment – we strongly recommend all our patients follow a program that eliminates and combats these known risk factors. Formalising this program and educating our patients regarding these important aspects of health, is one of the exciting additions we will be bringing to our patients this year. Tai Chi is a highly recommended method of dealing with stress and has many other health benefits as well. It has been a most enjoyable way for Toni to regain her health and deal with difficult times. She credits it with being a significant contributing factor to her recovery. Since returning from China Toni keeps a close eye on her health via regular tests. Her RGCC test in July 2016 showed her CTC (circulating tumour cells) had reduced from 8.7 to 5.1. A follow up test in October showed even further reduction to 3.7. Toni feels generally very well and continues to have a great quality of life in a beautiful part of the world where she still sees patients and enjoys spending time with her friends and family. 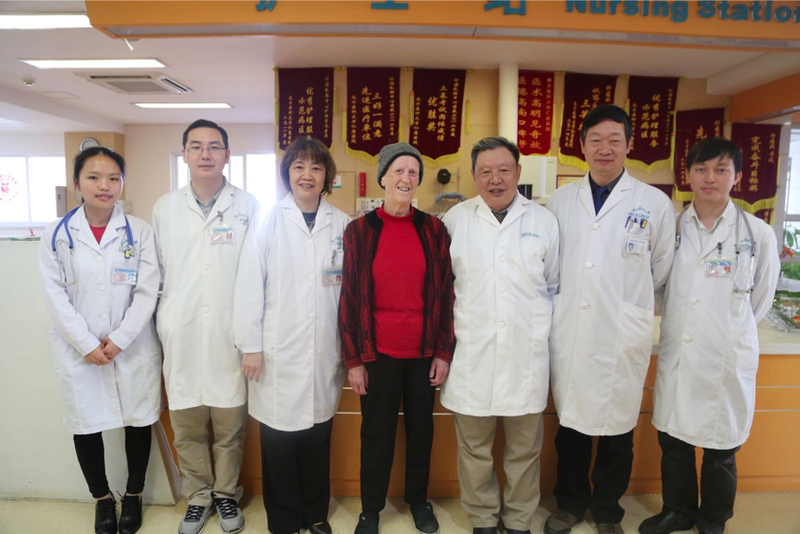 She is grateful to the team at Renkang Hospital/SPDT 4 LIFE for their dedication and commitment to helping her and other patients who have been given no help elsewhere. It was undoubtedly fortunate that Toni read the article about the Melbourne man traveling to China for treatment at Renkang and made the decision to ignore the advice of her Australian oncologist who tried to persuade her not to go, as he was concerned the treatment was “experimental.” Not surprisingly Toni does not see that particular doctor any more. The treatments that are carried out at SPDT 4 LIFE are far from experimental. They are evidenced–based methods that have been used for many years around the world with great success. A key focus of our team is to use the most effective, non-toxic, evidenced-based, methods available anywhere in the world. The most harmful treatment offered at SPDT 4 LIFE is chemotherapy – which is the standard and often only treatment offered in many countries, like Australia. But we use it cautiously and only under certain specific conditions. The difference between what we do a SPDT 4 LIFE and what is general practice in places like Australia, is that we will do the genetic testing on each patients cancer to establish what they are most sensitive to and would most likely be the most effective method of treatment. If the test shows that chemotherapy is the best option for a particular patient, it will then indicate exactly which form of chemo is most effective. Whereas in Australia, this test is not widely used, so oncologists tend to recommend a drug that is “usually’ effective in a particular form of cancer – say 70%. But if a patient is in the unlucky 30% that the drug is not effective for, then they go through the pain, suffering, destruction of their immune system and have wasted valuable time and money for nothing. We have unfortunately seen this happen to way too many of our patients. Furthermore Australian doctors tend to prescribe rather high levels of chemotherapy with no supportive or counteracting medications to negate the terrible side effects of chemotherapy and the damage it does to the body. At SPDT 4 LIFE we prescribe only the drugs that the RGCC test indicates will be most effective – taking all the guess work out of such a serious procedure. We also give lower doses of the chemo drugs and combine them with protective medications to support the organs to minimise the nasty side effects of the chemotherapy on the body. Combining SPDT with the prescribed medications also enhances the positive effects of the drugs and means less of the debilitating medicine is needed. To us at SPDT 4 LIFE this is just common sense and a logical responsible way to treat our patients. We are also acutely aware that no two patients are the same and it may be necessary to have a multi-pronged, synergistic approach to treating a patients disease. What works for one may not work for another, so it is important to have many different therapies available to fight the cancer. This is another major difference between what we offer and what Australian hospitals usually offer – surgery, radiation and chemotherapy. Furthermore, we are cognisant of the fact that a critical component in fighting cancer is having a strong immune system, so we are highly focused on protecting and supporting the immune system through our many therapies. SPDT and the other treatments we offer have no negative impact on the immune system and are non- toxic or harmful. Chemotherapy is the only treatment that is – so it is perplexing that the Australian doctors would criticise or question our procedures when what they offer is generally accepted as the most harmful methods available. Our reputation and results speak for themselves – we are famous for being able to help those who have been given no hope elsewhere. With the implementation of our new practices, therapies and education program in 2017, we are committed to achieving even greater results and helping many more people like Toni.